The community celebrated the grand opening of the Duvall Field concession building and teh surrounding plaza last Friday. 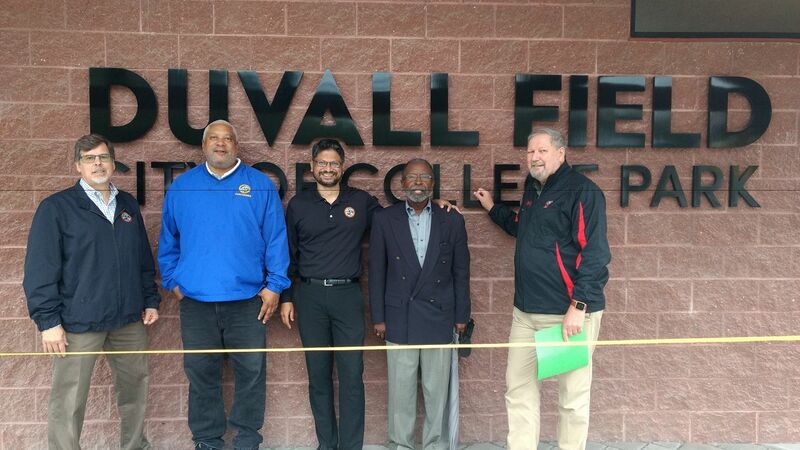 This gives us an opportunity to discuss the current and future use of Duvall Field facilities including field use and improvements. Food service has been limited due to Health Department regulations. There are existing Council-approved rules and regulations for use of city-owned recreation facilities, including Duvall Field. Use of the concession building has been managed through a permit process. The Council may wish for the Recreation Board to propose separate use criteria for the concession/restroom facilities for events when the fields are not in use. The City Council will discuss the field use policies of the concession building at this week’s worksession. Representatives of the College Park Boys and Girls Club and the Recreation Board have been invited to participate in the work session discussion about the future use of these facilities. CPB&GC has been granted precedence by the Council over other field use applicants. I was discussing Duvall field with neighbors and they mentioned that the kitchen doesn’t really have any oven or other appliances to prepare food. I recently moved to College Park from Manassas Park, Va and was a ‘marching band mom,’ so I have a 48 cup coffee urn, an electric skillet, and 18 quart slow cooker/roaster I will never use again. We used to slow cooker/roaster to keep donated food warm for band competitions – our local Popeye’s would donate 100 pieces of chicken and we would sell these at the concession stand, keeping them warm in the roaster for hours. I also have several disposable chafing dishes with stands we used for this purpose, available for donation. Please let me know if these items are needed and where I can donate them. Hi Lori, First welcome to our neighborhood, and thank you for your generous offer. Let me talk to a few community groups and see if they can make use your items. Thanks again.